The US and Japan have agreed to set up a second missile defence system on Japanese soil in an effort to counter the ballistic missile threat from North Korea, officials say. 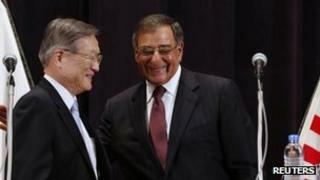 US Defence Secretary Leon Panetta made the announcement in Tokyo with Japan's defence minister. But the exact location of the system has not yet been determined. While both sides insist the system is not aimed at China, analysts say the decision is bound to anger Beijing. Mr Panetta's trip comes amid fresh tensions between Japan and China over disputed islands known as Diaoyu in China and Senkaku in Japan, after Japan sealed a deal to buy three of the islands. Japan and the US have worked on a joint missile defence system over the years. This new system would enable Japanese ships to cover other parts of the region, officials say. "[It] will enhance the alliance's ability to defend Japan, our forward deployed forces and the US homeland from a ballistic missile threat posed by North Korea," Mr Panetta said. In April, North Korea conducted a failed long-range rocket launch that it said was an attempt to put a satellite into orbit. Critics said the launch was a disguised test of missile technology, banned under UN resolutions. Mr Panetta also discussed with Japanese Defence Minister Satoshi Morimoto the deployment of US Osprey aircraft to Okinawa, which has angered local residents concerned about safety. Mr Panetta is on a week-long tour of Asia that includes China and New Zealand.